THE BEACHES – They are the city’s benchmark and the favorite thing to do for nine out of ten cariocas. 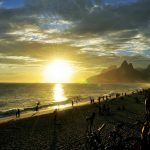 The seafront of Copacabana, Ipanema, Leblon and Barra da Tijuca are crowded on the weekends. However, from Monday to Friday, the late afternoon is one of the busiest periods around here. With an extra hour of sunshine and 30-degree nights, locals and tourists turned the night-time dive into a tradition. Also, the sunset on beaches like Arpoador is even more charming. It is good for joining friends, clapping for the end of another day and having fun. THE SANDS – During the day, the beaches of Rio boil up. And we are not talking about the temperatures exceeding 40°C. As people and vendors pass by frantically, cariocas do not forgo having some coconut water in one of the many kiosks lining up the seafront. An ice-cold beer, which is free to be consumed on the streets and beaches, also fits in well. On the sands, nothing is more carioca than ordering a glass of mate tea with lemon juice. The mixture is refreshing. If you get hungry, “biscoitos de polvilho”, which can be sweet or salty, are the favorite of those who live in the city. 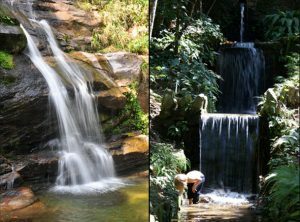 WATERFALLS – The city, which grew between the mountains and the sea, houses the largest urban forest in the world, the Tijuca Forest, where you may enjoy several waterfalls, which are no less crowded than the beaches. During the summer, the water has a mild temperature and helps you to forget the stresses of everyday life. Some are very accessible, such as waterfalls Chuveiro, Quebra and Gruta, located in Horto, in Jardim Botânico. You can find them on short trails, following the Dona Castorina Road, in Horto. The Horto Waterfall is another one that is very popular and easy to find. You should arrive there early. CYCLING – Rio is the city with the third largest network of cycle lanes in Brazil. Overall, there are over 450 kilometers of lanes. Since 2011, the city has a municipal system of bicycle rental stations, and using them has become a habit among cariocas. You just need to download the app and sign up to rent the bikes. On weekends, areas such as Aterro do Flamengo and Lagoa Rodrigo de Freitas, in Rio’s South Side, have a private bicycle rental service. PRE-CARNAVAL – In November, the samba schools start getting into the groove. Most of them promote weekly exhibitions. Schools such as Mangueira, Salgueiro and Portela manage to gather 5,000 people every night. But it is not only the samba that moves the summer in Rio. At this time, the groups of Carnaval dancers, which were dearly embraced by the cariocas, start making their street exhibitions. The gatherings take place in the late afternoon and are free of charge. One of the most traditional amongst these groups is “Orquestra Voadora” (the Flying Orchestra), in the gardens of Rio’s Museum of Modern Art (MAM), in Rio’s South Side, on Sundays.